If you’re looking for a Bluetooth speaker system to blast some tunes while on the go, you’re likely looking for something compact, but can also provide good sound and a long battery life, as well as durability that’ll take life’s bumps. Even though it’s not without its shortcomings, we think we’ve found one in the Ultimate Ears BOOM 2. Bluetooth – no, it’s not the name of a pirate. For those who might not know, it’s a wireless technology used in everything from computer peripherals, to mobile devices, to cars, and more. It doesn’t require line of sight like infrared, it’s resistant to interference, it requires very little power, and it won’t try to plunder your booty. That’s still a pirate thing. 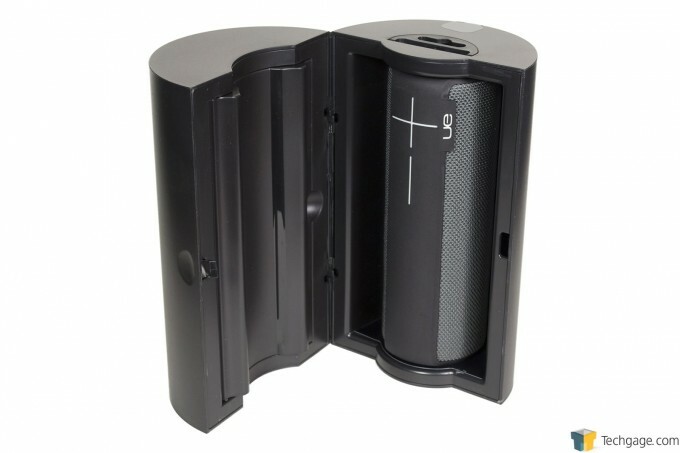 All of these properties make the protocol the ideal method to connect wireless speaker systems to Bluetooth devices, and today we just happen to have such a speaker system, the Ultimate Ears BOOM 2, or simply the UE BOOM 2. 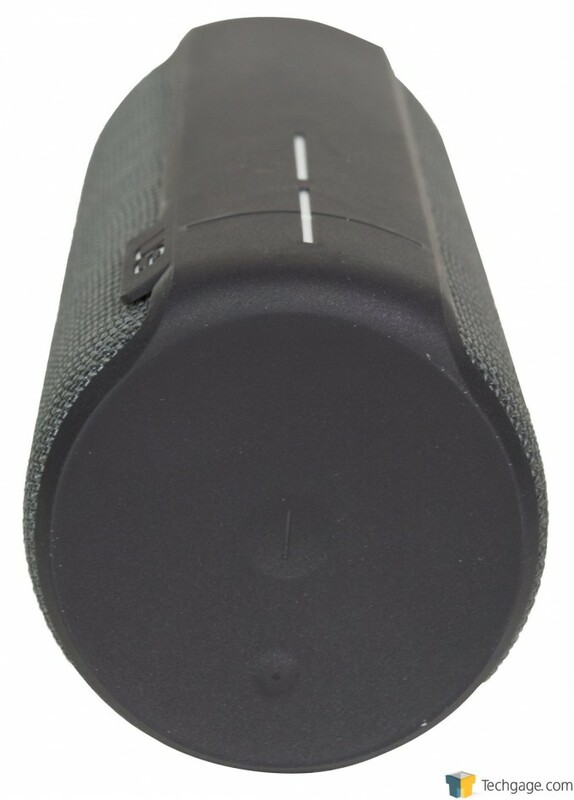 Other than the aforementioned Bluetooth connectivity, this entry in the Logitech UE BOOM family boasts key features such as pleasing aesthetics, an advertised battery life of 15 hours, a waterproof exterior, remote control via the companion app, and of course, great sound quality. 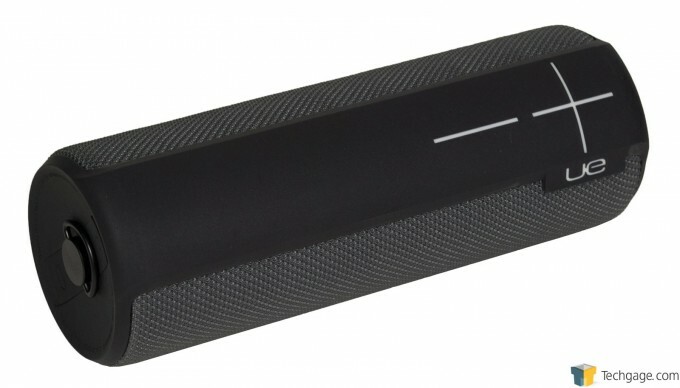 It’s an update to the original UE Boom that Brett Thomas reviewed a few years ago. Available in a number of color combinations such as orange and purple, green and blue, and now a very cool limited edition print called Rabbit Eye Movement, our black and grey review sample dubbed “Phantom” came packed in a plastic cylinder wrapped in a cardstock sleeve. 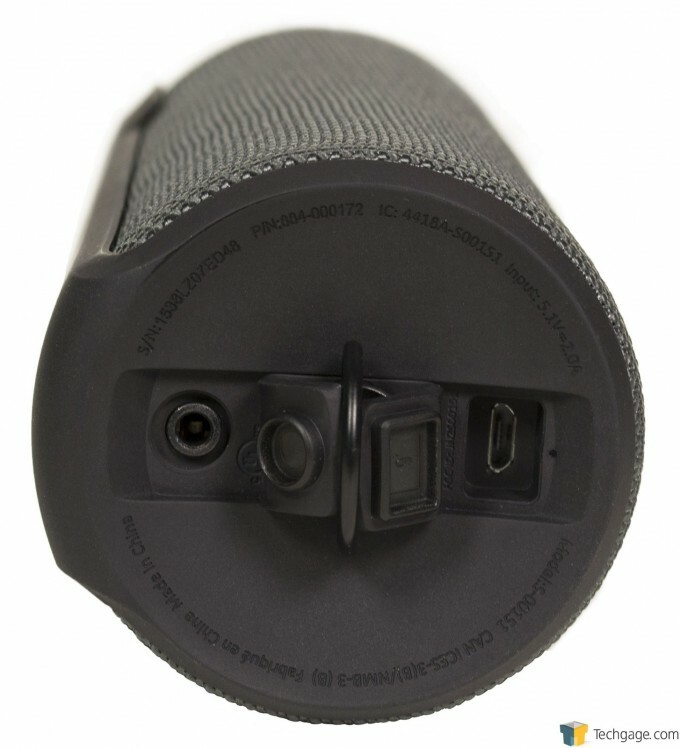 The cylinder splits in half to reveal the UE BOOM 2 on the right side, and a compartment on the left that holds the accessories. The main unit itself is pretty unassuming. At 180mm high and 67mm in diameter, the 1.2lbs BOOM 2 features a soft touch coating on the top where the + and – symbols act as the volume buttons. This wraps around to both ends while the rest of the unit is covered in a hard fabric mesh. The mesh exterior hides two 45mm drivers coupled with a pair of 45mm passive radiators. This design should allow for a higher volume output while keeping the overall footprint as small as possible, as well as providing longer battery life. On the end closest to the volume control, which would be the top if you were stand the unit up, is a dimple that houses the power button. 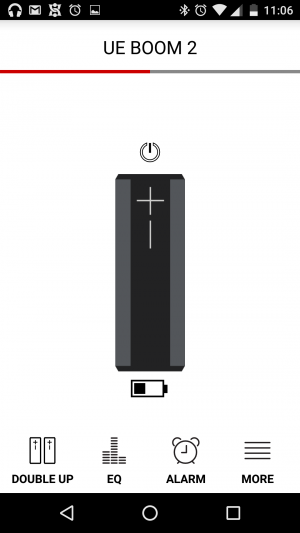 The illumination of the power button will change from white to red when the battery level becomes low. Next to it is the raised Bluetooth button that makes the unit available to pair with a compatible media player. The opposite end houses a 3.5mm audio input for wired connectivity as shown on the left, a removable D-ring in the middle to secure it to a tripod, and a mini-USB charging port on the right. The audio input and charging ports are covered by rubber flaps that seal the openings to keep out dirt, but also make the BOOM 2 able to survive dunks in water up to 1 meter deep, for up to 30 minutes. Included with the BOOM 2 are the USB charging cable, an AC adapter to allow charging from a wall outlet, and a small fold out with some safety and warranty information. 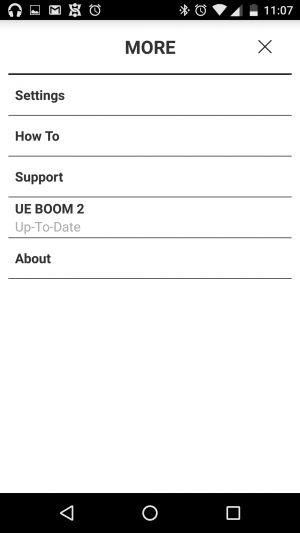 The UE BOOM 2, like all other models in the BOOM series, offers a free companion app available on the Google Play and Apple App stores. Even though the BOOM 2 can be used without the app, it allows users to power the unit on and off remotely, view the current battery level, set up a second unit to play from the same source, make changes to the equalizer (EQ), or set an alarm. Within the More section is where you’ll find some app settings such as disabling notifications, disabling Tap Control, which we’ll look at shortly during testing, and disabling a standby mode of sorts called Bluetooth Smart that allows for certain remote options. There’s also an option to push out any available firmware updates, view information about the app and the device such as the serial number, as well as a How To section that acts as a user manual, which should prove to be very useful since one wasn’t provided with our sample.